Every year about 1.3 billion tons or one-third of food production is wasted globally. Difficult climatic conditions, limitations in harvesting, storage and cooling facilities, lack of proper infrastructure, packaging and management mainly in developing countries leads to the food loss. Initiatives such as ‘Stop Wasting Food’ in Denmark and Waste Reduction Action Plan (WRAP) in the UK encourage reducing the amount of food and packaging waste. For effective food supply chain management from farm to fork is increasing the need for effective packaging solutions for fresh foods. Leading vendors are focusing on acquisition and strategic investment to expand their fresh food packaging business in different countries. For instance, International Paper Company acquired Madrid mill worth USD 160 million to expand the packaging business in EMEA region. In 2016, International Paper Company also invested USD 170 million in containerboard mills based in Prattville, Ala., and Springfield, Ore., to expand capacity and efficiency of the company. In 2015, Amcor Limited acquired Nampak Flexibles, the market leader in flexible packaging in South Africa was acquired USD 22 million. This acquisition provides a platform for to the company to expand the business in the African region. Market players are focusing to strengthen their market positing to create new opportunity to influence the consumers by their product innovation and design capabilities. However, presence of inclination of consumer towards low cost local products and rising number of local and regional players are creating high market competition environment for leading vendors in the fresh food packaging market. 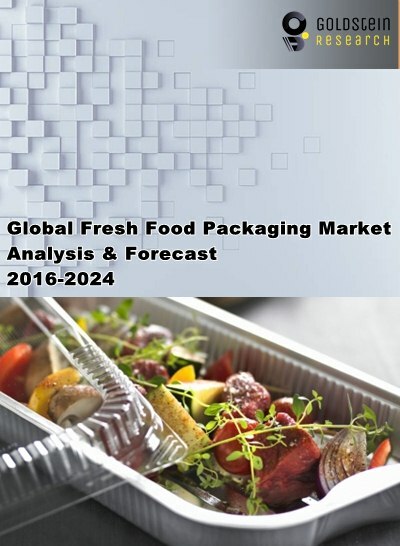 Global fresh food packaging market is projected to reach USD 102.7 Billion by 2024, growing at a CAGR of 3.90% during the forecast period. Extended shelf life and convenience in fresh food transportation are propelling the need for effective fresh food packaging. Asia-Pacific is the fastest growing region for global fresh food packaging market, owing to the increasing export and import of food from countries such as China, Philippines, Vietnam, India and Indonesia. Moreover, rising number quick service restaurants facilities and adoption of packaging for cooked food in the region are also bolstering the growth of Asia-Pacific fresh food packaging market. High amount of food wastage and rising awareness and concerns about global warming are leading for the adoption of innovative techniques of fresh food packaging and positively impacting the growth of market. North America fresh food packaging market. In North America region, per capita food waste is nearly 85-95 kg every year. Concerns over disposing the waste material during the manufacturing and packaging process and fluctuating cost of raw material and its availability are likely to hinder the adoption of fresh food packaging and thereby impact the market growth. Changing consumer preferences over fiber-based products and non-fiber substitutes affects the prices of packaging products. Tax affairs of operations in different countries and changes in regulatory regimes may adversely impact the market players to expand the fresh food packaging business in foreign countries. These factors are expected to inhibit the growth of the global fresh food packaging market. However, rising awareness on reducing the amount of food waste and demand for convenient food solution are paving the way for innovative fresh food packaging and expanding the fresh food packaging business across the globe.